California’s byzantine water system and crushing drought are leading farmers to extraordinary measures as they try to keep themselves from running dry. March 26, 2015 — Editor’s note: This story was produced in collaboration with the Food & Environment Reporting Network, a non-profit investigative news organization. On a warm March afternoon, farmer Cannon Michael walks alongside wheat fields adjacent to his house in Los Banos, in California’s Central Valley. Most of these fields won’t be watered again this year. “Wheat’s not a glamorous crop, but it makes a lot of bread,” Michael quips. This wheat, though, won’t return much money, Michael says. So it will be harvested for his sister’s two bakeries in San Francisco and the land fallowed, along with some fields formerly planted in alfalfa and cotton. They are among more than 1,000 acres Michael left unplanted this season to try and conserve water, amounting to about 10 percent of the 10,500 irrigated acres that make up his farm, Bowles Farming Company. Walking past the fields with his wife, Heidi, and their three young sons to a nearby barn with goats and sheep, Michael jokes about an imaginary Taylor Swift song called, “Sheep It Off,” much to his kids’ dismay. Michael has a humorous side, but laughter can’t mask the rough reality of farming today in the Central Valley, a place famed for its abundant bounty of fruits and vegetables. By the spring of 2014, the region’s farmers had gone into survival mode. They hoped to secure enough water for a decent harvest, but last summer about 15,000 farmers on San Joaquin Valley’s east side received zero allocations of water from the Central Valley Project, the federal project in charge of storing and managing much of California’s water. The state’s worst drought in 1,200 years ravaged the region. The drought, in combination with this long-established government system for deciding who gets water and who does not, has split the valley. Now Michael’s life, it seems, is almost exclusively focused on finding ways to conserve water and helping his neighbors who lack the precious resource. There’s no time to waste. If Michael and his peers can’t figure out a way to conserve and share the water that remains, one of the world’s most productive agricultural regions will be jeopardized. California agriculture is a $46 billion industry, and the Central Valley alone produces nearly half of the United States’ vegetables, fruits and nuts in its Class 1 soil — the highest quality. Water here has always been in relatively short supply. Head west of the 100th meridian in the United States and rainfall becomes less prevalent, making irrigation necessary for cultivating crops. Aridity varies even within California, with most precipitation happening in the north and most agriculture in the south. To bring the water south, the federal government authorized the Central Valley Project in 1935. The project involved the construction of dams, reservoirs, canals, conduits and tunnels that make it possible to transport water from the state’s largest reservoir, the now shrinking Shasta Lake in northern California, south about 450 miles to Bakersfield. There, the water is allocated to customers for various uses, including to irrigate about 3 million acres of farmland — about 38 percent of the state’s 7.9 million acres of irrigated farmland. When his neighbors on the east side of the valley were struggling last spring, Michael saw frustration and heartbreak all around him. The Central Valley Project is one of California’s two largest water projects. The other, the State Water Project, began in the late 1950s and now supplies water from northern state rivers for 750,000 acres of irrigated farmland and 25 million residents in the south. Most farmers contract to receive a specific amount of water from one of these two projects, but the byzantine system of allocations means that some farmers are at the front of the line for water, while others stand much further back. In a time of drought, a lack of access to this water can be fatal. When his neighbors on the east side of the valley were struggling last spring, Michael saw frustration and heartbreak all around him. Workers were laid off, land for row crops fallowed and high-profit almond orchards ripped out because they were too water thirsty. Water traded hands on the open market at rates much higher than usual. These were his friends and colleagues, and the men and women responsible for supplying much of the country’s tomatoes, carrots, grapes, apricots, and asparagus and 80 percent of the world’s almonds. In response, Michael and some of his peers who had water did something unprecedented: They implemented conservation measures and fallowed land early in last year’s season to make 13,500 acre-feet (4.4 billion gallons) of water, from a reservoir known as Millerton Lake, available to east-side farmers who had been cut off. And they did so at an affordable price. This was the first time in Bowles’ history the company — along with other west-side farmers — exercised its rights to take their allotment from Millerton Lake. Michael says he didn’t want to put a call on his historic water source, but felt he had no choice. He wanted to find a way to help his east-side neighbors by fallowing land and putting some extra water back on the market for junior users. While water sales, or “transfers,” occur regularly each year, shifting surface water to farmers in need, the process is not as simple as it might appear due to California’s complicated dual water system. Just who gets surface water, how much and in what order is determined by that system, which incorporates both riparian rights (access for those adjacent to waterways) and prior appropriation, which gives senior rights to those who first diverted water for beneficial use. Meanwhile, to get a groundwater right, for the most part a user need only drill a well. The Water Commission Act of 1914 established today’s permit process for surface water and the agency — now the State Water Resources Control Board — to administer it. Farmers with junior rights need a permit; those, like Michael, with pre-1914 rights — senior rights — don’t. What made last year’s transfer different from a typical water deal is that the senior appropriators priced water at $250 per acre-foot, while other sales at the time priced water between $1,000 and $2,000 per acre-foot. Had they sold at the higher price, the senior appropriators could have made $27 million, according to a local news report. “We saw an opportunity to transfer some water to our neighbors who were struggling,” Michael says. Chris Hurd, a fourth-generation farmer with junior rights in the San Joaquin Valley with 1,500 acres — row crops, almonds and pistachios — says he doesn’t begrudge senior appropriators for exercising their right last year. Though Hurd wasn’t a recipient of last year’s transfer, he commends what his fellow farmers did, while acknowledging they were privileged enough to make that move. Fourth-generation farmer Chris Hurd isn’t sure his farming operation will survive a fourth year of California’s historic drought. “I stayed alive last year,” he says, “but I’m not sure I’ll make it this year.” See more photos here. Photo by Sonya Doctorian. “Cannon is a friend and a great farmer, but his world is considerably different than mine because of senior water rights,” Hurd says. While Michael thinks it’s too soon to say whether another transfer can happen this year, Hurd says there’s not even enough water in the system to move around. The 33-year-veteran farmer doesn’t know what will happen to his business in the coming years. But the outlook isn’t good. 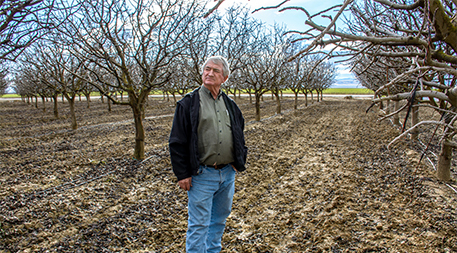 Though he has transitioned his farm to 100 percent drip irrigation, he removed 120 acres of almonds from production last year and may soon fallow another 80 acres. Growing up in San Francisco, Michael spent summers working at Bowles Farming Company, which his grandfather and great-uncle had started in the 1960s. After receiving an English degree from the University of California, Berkeley, Michael moved to Atlanta to work in real estate. In 1998, he returned to his family business after the uncle in charge of Bowles fell ill, and in January 2014 he became president, overseeing crops of cotton, alfalfa, corn, wheat, tomatoes, onions, melons and almond trees (planted a few years ago, before the drought got really bad). He also manages 650 acres as waterfowl habitat. Michael has also become a leader of collaboration among his peers; his Twitter profile says, “Ag interests need to unite.” The 43-year-old, sixth-generation farmer aims to “keep California farmers farming,” he says, with the fourth year of drought looming. In addition to the water transfer, Michael has reduced tillage to help the soil retain more water. He’s also part of a University of California Cooperative Extension team evaluating how drones can save water by, for example, capturing detailed data to pinpoint irrigation leaks for immediate repair. At Bowles, stacks of PVC pipes lie in wait around the farm to be buried in trenches for drip irrigation. Almost half of the farm is now on drip, and Michael expects to eventually get to 70 percent. Up-front costs aren’t cheap — $1,500 per acre in materials and labor to install — but drip irrigation saves substantial amounts of water and labor and improves yield, he says. Bowles previously flooded cotton fields, requiring six acre-feet of water; drip irrigation cuts that water consumption in half. The multi-year drought has shown the chain reaction of drastic water shortages: from farmers leaving land fallow, resulting in less food, to dropping incomes to less work available for farmworkers to harming the state’s economy. About 17,100 jobs have been lost, and the drought cost the agricultural sector an estimated $2.2 billion in lost crop revenue and wages and increased groundwater pumping last year, according to a July 2014 UC Davis Center for Watershed Sciences report. Researchers estimated that by the end of 2014 at least 410,000 acres in the Central Valley would be fallowed. 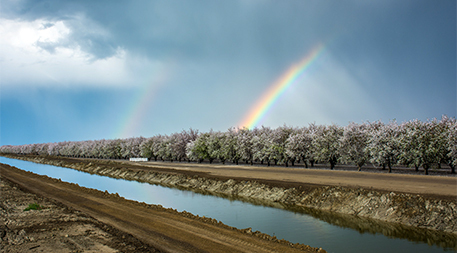 A rainbow appears over an almond orchard after a brief March shower. Winter is usually the rainy season in the Central Valley, but January saw nearly no rainfall this year in Fresno County and just over an inch in February. See more photos here. Photo by Sonya Doctorian. On March 12, an op-ed by Jay Famiglietti in the Los Angeles Times brought more dire news, stating that California has only about one year of water left in its reservoirs and noting that groundwater and snowpack levels are also at all-time lows. 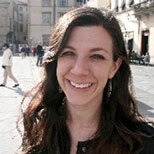 Famiglietti, senior water scientist at the NASA Jet Propulsion Laboratory, wrote that NASA satellites show the total amount of water stored in all the snow, soil, groundwater, rivers and reservoirs in the Sacramento and San Joaquin river basins was 34 million acre-feet below normal in 2014. All of this is leading farmers to drain the state’s underground aquifers, causing the valley to sink. Groundwater used to be how farmers supplemented water needs, but as the drought continues, it has become the go-to source. The Sustainable Groundwater Management Act took effect January 1, 2015, to address overpumping, but the legislation doesn’t immediately stop the practice, instead requiring the formation of local agencies to adopt sustainability plans within five to seven years. Plan objectives must then be achieved within 20 years. Michael dug wells on his farm, he says, “as an insurance policy in case we have to use them.” He’d rather not. Of 27 major rivers, 16 had allocations greater than 100 percent of natural supplies; the San Joaquin River had the highest allocation level at 861 percent. Besides the drought, problems seem to stem from poor accounting of water usage. The state’s water right allocations now total five times more surface water than is available in a good rainfall year, and regulators struggle to figure out whose supplies to cut during a drought because of inaccurate reporting from water appropriators and the complicated water-rights system, according to a UC Davis report published in August. Ted Grantham, formerly a postdoctoral researcher at the university who now works as a research biologist for the U.S. Geological Survey, and colleagues analyzed all post-1914 appropriative water rights, which includes state allocations and allocations from the federal Central Valley Project (riparian and pre-1914 rights were excluded because they’re not fully accounted for in the state’s database) and found that allocations exceed surface water supply by about 300 million acre-feet — more than five times the 70 million acre-feet available in a good rainfall year. Of 27 major rivers, 16 had allocations greater than 100 percent of natural supplies; the San Joaquin River had the highest allocation level at 861 percent. The researchers also found that most water right holders have a permit but not a license. Permits spell out the specific parameters of proposed projects to divert water for beneficial use, and the license is supposed to be the final confirmation of a water right, issued once the project has been completed and inspected. The licensing stage should be a time for review, but the State Water Board isn’t seeing permits through to this point. If it did, Grantham says, it might help with the overallocation issue. “That’s an opportunity to modify water rights and bring them closer to reality in terms of what is actually being used,” he says. In February, the U.S. Bureau of Reclamation once again allocated no water deliveries from the Central Valley Project for junior appropriators. Municipal and industrial users will get 25 percent of their historic use or enough to meet health and safety needs. Though the project is obligated to deliver 75 percent of requested amounts to senior appropriators, Michael is expecting to get a 40 percent supply because this is a “critical year” for Shasta Lake. Michael says the project’s obligation can be broken by a provision in the contract known as an “Act of God” provision, which includes drought conditions. The nonprofit Water Education Foundation recently named Michael to its board of directors, through which he’ll work with businesses, environmentalists and water agencies to raise public awareness about water as a valuable and limited resource. It seems interesting and can be useful for people in other parts of the world. Is there any attempt to address the disproportionate usage of water by the animal agriculture industry? The water figures are staggering in terms of both livestock and the crops like alfalfa grown for livestock. Many of us don't eat animal products precisely because we don't want to support this wasteful and environmentally damaging industry. But it would be nice if there was an official accounting of just how damaging this global industry is on an ecological scale. Sadly, I know the meat industry has a lot of political clout which prevents wide dissemination of this information. Where did your food come from this past six months? Julie, did you mean to direct me to a "source" that was actually a post by "The Morris Grassfed Beef Team"? If so, there are better, unbiased resources you could cite. The first link under the chart isn't available, and the second doesn't substantiate the numbers. The figures with grass-fed beef, however low or high the estimates, are contentious because they don't take into account the full ecological footprint of beef. The Judith Capper study (among others) from WSU confirms this, and even detractors have to concede that both methods of production highly wasteful and problematic, whether in terms of land, water or energy. This is significant because there are viable studies showing just what grass-fed animals do on, for instance, our public lands in terms of destroying riparian areas and water quality, which isn't measured by these numbers. Does this figure include the water used in "processing" these animals as well? This graph does not contain anything close to the entire picture of where grass-fed cows fit into the carbon, water, and environmental cycles. And increasingly grass-fed cows are supplemented with alfalfa and other water-intensive crops like hay which tend to nullify any arguments about water reductions. This is particularly true in drought areas of California where there simply isn't enough grass owing to lack of rainfall. Furthermore, isn't it true that fewer than 20 operations in California are actually grassfed, meaning that the bulk of meat production in California is through intensive farming, which brings us back, again, to the water footprint. And there simply isn't enough land or enough water for grassfed operations to be implemented on a large scale, even if that were desirable, which it isn't, owing to the competitive nature of cattle versus wildlife and habitat where they are allowed to graze freely. As renewable energy companies enter the Central Valley, what groups or individuals will benefit the most? What will the Central Valley look like in 30-50 years? A hall of mirrors? Will tech-titans plant server farms over traditional farms, and will farming communities become more like human settlements run on technology? Possibly . It seems to me that one crucial, yet very hard to quantify, piece of the puzzle is context. If we are eating meat, where was it (and more importantly, its food) raised? Is water abundant there? What else might be grown instead of animal feed? If animals are grass fed, have they taken the place of the large herbivores critical to grassland ecosystem functioning? I'm an advocate for more transparency and traceability in the food system so we can actually get answers to these questions! Where's the mulch? Driving north from LA to Sacramento on I5 you will not see a mulched field. Consciously increase coconut plantation along Californian coasts, increase green cover by growing coastal friendly vegetation.